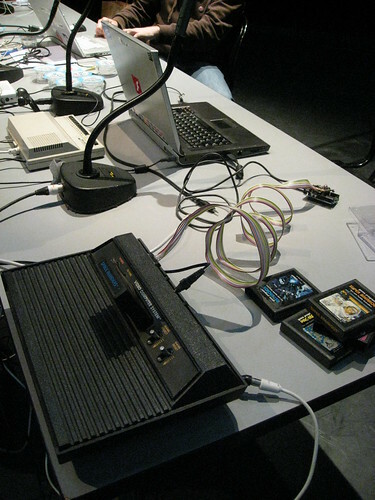 This year’s motto was "Play" so for the closing ceremony I wanted the whole audience to play with my Atari 2600 console. Therefore I have built an interface which allows me to simulate a joystick and paddles with my Arduino board. The directions are triggered by tracking the motion of the audience. Since I couldn’t test any of this in advance I wrote an AIR application which allowed me to adjust the motion tracking zones and the sensitivity on the fly. Fortunately in the end everything worked very well and I think everybody had quite some fun.